HarvardScience is geared to the interested scientist as much as the general public and members of the media. The site’s rich media clips and photography provide content of general interest, while the links to related content are a gold mine of information for someone conducting research in the field. Built on a small budget to handle a limited public relations role, the site’s rapid success has turned it into an important news channel for the innovation and research happening at Harvard. The actual volume of news stories in the site has turned out to be several multiples of what was originally expected, requiring a Page 2 with a spillover of the news stories on the home page. 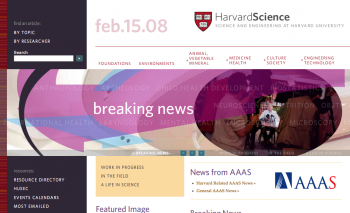 HarvardScience is a publication of the Harvard Office of News and Public Affairs. It was developed jointly with studio:module, and Maureen Lyons provided her programming expertise for developing the site in Drupal.